The Alamo is a museum in San Antonio, Texas. It was originally built as a mission (for education and conversion to Christianity of the Native American population) by the Spanish Empire in the 18th century. It was later abandoned as a mission, and instead used as a fortress in the 19th century, and it is for the latter use that it is most famous. The Alamo was the scene of several military actions, most notably the Battle of the Alamo in 1836 during the Texas Revolution (which led to Texas' independence from Mexico. 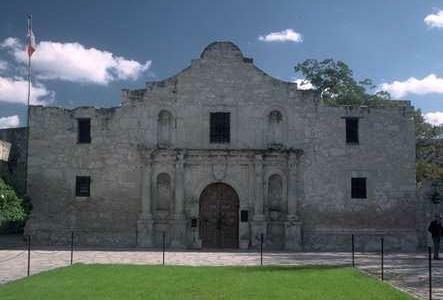 In this battle, Texian forces were beseiged in the Alamo by the army of the Republic of Mexico. After a 13 day seige, the Alamo fell with the death of nearly all the Texian defenders (who included Jim Bowie and Davy Crockett). Although the Texians lost the Battle of the Alamo, they were successful in delaying the Mexican advance. Just over one month later, the Mexican Army was defeated at the Battle of San Jacinto at La Porte by a Texian Army led by Sam Houston, who used the famous battle cry, "Remember the Alamo! Remember Goliad!"